Foundations may be constructed on fills and backfilled material. Fills may include conventional compacted fills; hydraulic fills; and uncontrolled fills of soils or industrial and domestic wastes, such as ashes, slag, chemical wastes, building rubble, and refuse. Properly placed compacted fill will be more rigid and uniform and have greater strength than most natural soils. Hydraulic fills may be compacted or uncompacted and are an economical means of providing fill over large areas. Except when cohesionless materials, i.e., clean sands and gravels, are placed under controlled conditions so silty pockets are avoided and are compacted as they are placed, hydraulic fills will generally require some type of stabilization to ensure adequate foundations. Learn about hydraulic fills and their application. This course is intended for civil engineers, structural engineers, geotechnical engineers, geologists and other design and construction professionals wanting an introduction to methods and techniques for fill and backfill construction for foundations and footings for buildings and structures. This course will give engineers and other design and construction professionals an introduction to fill and backfill construction for structure foundations. This is an introduction to methods, techniques and equipment for selecting, placing and compacting fill and backfill materials for structure foundations. 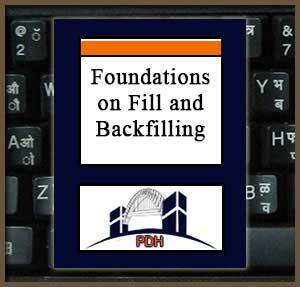 This course will give you an introduction to fill and backfilling for structure foundations.